Take advantage of these amazing prices and special deals on exciting displays, exhibits and trade show exhibition booths. This page is updated often so check back to save on featured display products and trussing exhibit booths. Contact one of our helpful staff for details on these items. Hurry these won't last long ! This attractive 6"profile mini truss structure is a fantastic sale price on an exciting mini truss system that assembles easily and quickly. This is our smallest and most portable truss display booth and at this price you can't go wrong! It's cost effective, light weight but still very strong, unlike a lot of the steel fake truss packages imported from China. Our trusses can be altered, mixed and matched or custom made to create any shpae or size you like. Offshore products can't without long delivery times. 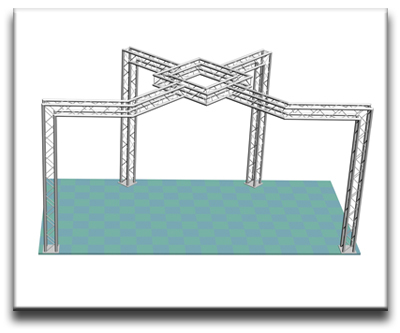 This unique and 100% recyclable aluminum mini truss truss structure serves as another example of the interesting variety of custom truss systems we produce. A trade show booth like this is meant to be an eye-catching display of your products and services that will draw in customers. 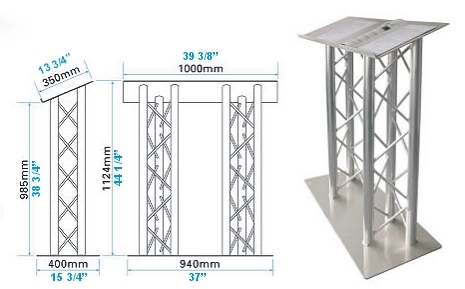 Add items like banner displays, LCD TV or plasma TV stands to decorate your mini truss display booth. This trade show display, made of sturdy and durable 4 chord (box) truss in a 6" profile , comes easy-to-assemble pieces, each made from lightweight aluminum truss. This structure is BRAND NEW and ready to ship. This particular model is very popular and at this huge discounted sale price they will sell very fast so don't delay! We have a limited numer on sale and when they are gone they are gone. 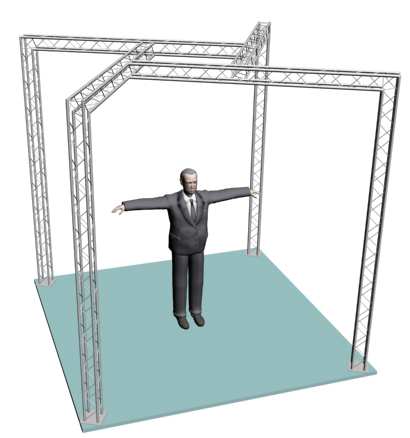 This durable 10"profile box truss structure is an exciting and attractive truss design that assembles easily and quickly. This booth is a cost effective light weight but very strong display booth. This unique aluminum truss structure serves as an example of the interesting variety of custom truss systems we produce. A trade show display like this creates an eye-catching presence that will draw in customers, particularly when coupled with things like banner displays, LCD TV or plasma TV stands, and other pop up displays. This trade show display, made of sturdy and durable 4 chord (box) truss, comes easy-to-assemble pieces, each made from lightweight aluminum truss. This structure is BRAND NEW and ready to ship. They are have been popular and priced well so don't delay ! Strong and durable this 12"profile box truss structure is an alteration to the The Spider series of display deigns. Exciting and attractive it assembles quickly and effortlessly. This exhibit booth is a light weight design but very strong. A unique aluminum truss structure that functions as an example of the creative variety of custom truss displays and exhibit booths we fabricate and stock. A trade show exhibit booth like this offers an eye-catching visual that will lure in customers, particularly when accessorized with other truss options and add-ons such as banner displays, LCD TV or plasma TV stands, lecterns and other pop up display items. 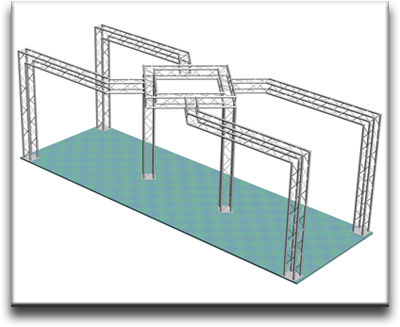 This trade show exhibit, made of sturdy and durable 4 chord (box) truss, comes in easy-to-assemble trusses and junctions, each made from lightweight aluminum truss. This exhibit design is BRAND NEW and ready to order. This design has been popular and priced well so don't wait to order yours today! 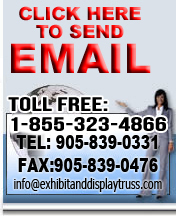 Check out more standard size displays and trade show booths click here. Contact us for any custom needs you have as we can turn it around in days. Email us.